TRACKING DE BLASIO: the mayor had a tough PR day Friday after deciding to go to his Park Slope YMCA for a workout after learning that an FDNY firefighter had been shot and during the subsequent standoff on Staten Island. The incident ended with the gunman dead and no other casualties. Meanwhile, the injured firefighter was treated over the weekend and able to go home. Many questioned de Blasio's choice to go for his workout, though the mayor and his team insist he was getting briefed all morning and that he went to Staten Island when his fire and police department chiefs, who were there all morning, gave him the go-ahead. Still, the day's events highlight the questions around de Blasio commuting from his temporary mayoral home on the Upper East Side at Gracie Mansion, to his old Park Slope neighborhood to work out, even on days without a real-time crisis playing out. There are also, of course, the ongoing issues related to Staten Island and whether the borough gets its due attention from City Hall (under any mayor) - read our new deep dive on the issue, Does Staten Island Gets Its Fair Share?, which was weeks in the making and happened to coincide with Friday's events. Over the weekend: on Saturday, de Blasio was on Long Island for the annual event, "Apollo in the Hamptons." On Saturday afternoon, the mayor joined Alexander Soros (son of billionaire philanthropist George Soros) and others for lunch, according to Soros' Twitter feed. Sunday the mayor had no public events. 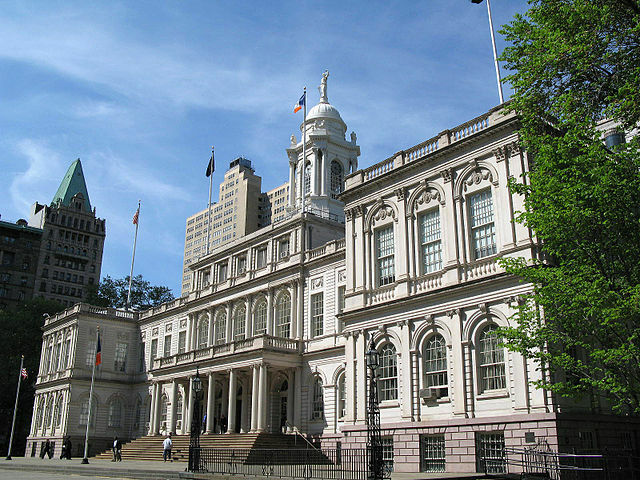 The week ahead could very well see the mayor sign into law new legislation passed by the City Council on Thursday aimed at preventing outbreaks of Legionnaires' Disease, as well as other new bills passed through the Council, such as one mandating fire sprinklers in pet stores. Indicative of the slow pace that the week could see, the mayor is spending Monday in Rhode Island, with no public events scheduled. LEGIONNAIRES' LATEST: the outbreak of Legionnaires' disease that has taken 12 lives in the Bronx appears to have abated. The mayor's office reports that there have been no cases with onset of symptoms after August 3. A total of 124 people are reported to have had symptoms during the outbreak, with 94 treated and discharged. The 12 deceased were all "adults with underlying medical conditions." Many of the water cooling towers at the heart of the outbreak (which is airborne and similar to pneumonia, not contracted through drinking water or person-to-person) have been disinfected and the City Council passed new legislation aimed at preventing future outbreaks. As Council Member Corey Johnson, chair of the Council health committee, and others have said, Legionnaires' isn't going to completely go away, and there are many cases each year, but important steps can be taken to prevent major outbreaks. There is a town hall meeting on Legionnaires' scheduled for Monday in the Bronx, see below for details. It's looking like a quiet August week as of now - only a few events on our radar for you to be aware of - though others will surely pop up as the week begins - read our initial day-by-day rundown below. On Monday, "Governor Cuomo's administration hosts a summit on emergency planning attended by hundreds of disaster management officials and local leaders from across New York State." At 10 a.m., "Senior administration officials kick off the summit with a presentation on emergency preparedness and make an announcement – Empire State Plaza Convention Center," and at 1:15 p.m., "Tour of the New York State Office of Emergency Management's Emergency Operations Center and various State emergency response assets – Building 22, Harriman State Office Campus." At 2 p.m. in Glendale, City Council Members Rory Lancman and Elizabeth Crowley, the Anti-Defamation League, Queens Jewish Community Council, Family members of Leo Frank, Public Advocate Letitia James, Queens Borough President Melinda Katz, Assembly Member David Weprin, and others will mark "the 100th anniversay of the lynching of Leo Frank" with "a memorial to commemorate this tragic event in Jewish-American history. Following his wrongful conviction for murder in a trial marked by antisemitism, Frank was kidnapped from prison, brutally beaten and hanged in 1915 in Marietta, Georgia. He is buried at the Maple Grove Cemetery in Glendale, where the ADL dedicated a monument to him in 2003." At 6 p.m. community leaders in the Bronx will host a town hall on Legionnaires' Disease at Hostos Community College. Sponsors include Assembly Speaker Carl Heastie, Council Speaker Melissa Mark-Viverito, Public Advocate Letitia James, NYC Comptroller Scott Stringer, the NYC Health Department and NYC Emergency Management, and the Mayor's Community Affairs Unit. At 6 p.m. Tuesday NYC Department of Citywide Administrative Services presents a NYC Civil Service 101 session, on "everything you need to know about applying and becoming a civil servant." Sponsors include Council Member Laurie Cumbo, Congresswoman Yvette Clarke, Congressman Hakeem Jeffries, Senator Jesse Hamilton,Senator Velmanette Montgomery, Assemblyman Walter Mosley and Assemblywoman Diana Richardson. At 6 p.m. Wednesday NYC Department of Citywide Administrative Services presents a NYC Civil Service 101 session, on "everything you need to know about applying and becoming a civil servant." Sponsors include Council Member Laurie Cumbo, Congresswoman Yvette Clarke, Congressman Hakeem Jeffries, Senator Jesse Hamilton,Senator Velmanette Montgomery, Assemblyman Walter Mosley and Assemblywoman Diana Richardson. Also at 6 p.m. Wednesday, Letitia James is hosting a public safety town hall meeting in Brooklyn, with NYPD Chief of Patrol Carlos Gomez and Brooklyn North Borough Commander, Jefferey Maddrey. At 8:30 a.m. Thursday the Manhattan Borough Board, led by Borough President Brewer, will hold its August meeting. At 10 a.m. Educators 4 Excellence will kick off the school year with its 2015 Member Summit and host new State Education Commissioner MaryEllen Elia as a guest speaker. There will be sessions on leadership, advocacy and finish the day with a school culture policy paper on climate change. At 7 p.m. Thursday, the New York Young Republican Club is hosting its monthly meeting. Former Mayor of Walden, Brian Maher, will be the speaker. Elected at 23 years old, Mr. Maher was the youngest mayor in New York State. City and State's fifth annual "On Energy" forum is scheduled for Thursday. Looking quiet right now, but we'll be keeping an eye out for end of week events, and you should too!